ComBots Cup VI Combot Robot Championship, the world heavyweight championship for robots, takes place October 29 & 30 in San Mateo, CA. 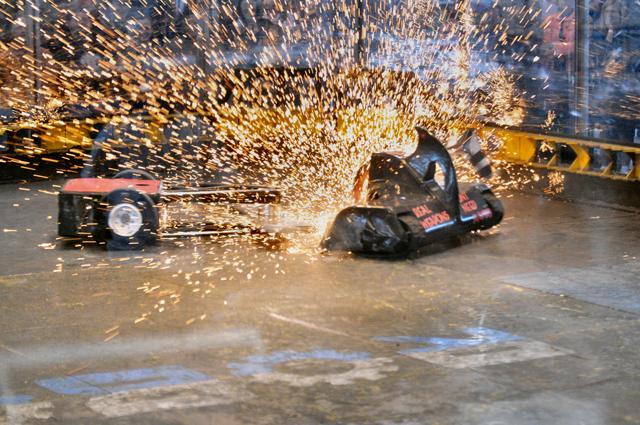 The eventfeatures a slew of robots duking it out for “dominance, cash, and the glory that is the ComBots Cup – 100 pounds of trophy-shaped awesome”. More info Facebook and advance tickets are now available. The most applied physics you can get in one giant 40×40 foot bulletproof arena! See all your favorite robots like Sewer Snake and Original Sin plus some new blood, go head to head to see who wins 100-lb The ComBots Cup trophy and prize purse, and who goes home in a bucket! Fun for the whole family – if your family likes Total Robot Destruction!